Built in 1940 to commemorate the 400th anniversary of Francisco V·squez de Coronado’s exploration of the Southwest, this church is the largest Spanish adobe structure in the United States and is considered by many the finest example of Pueblo-style architecture anywhere. Its hand-carved stone reredos, taken from the older part of the Cathedral of St. Frances of Assisi, dates from 1761. 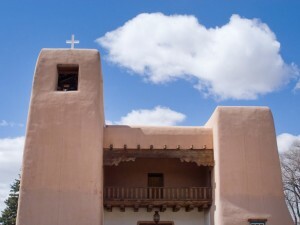 The church was constructed in the old-fashioned way by parishioners, who mixed the more than 200,000 mud-and-straw adobe bricks and hauled them into place. The 225-ton stone reredos (altar screen) is magnificent.